The second earlies (Kestrel and Charlotte) are now in two rows in the bed closest to Keith. Next to that was supposed to be a spud bed too, but for some reason it´s full of mental garlic! I can only imagine that it´s leftovers from last year, as Chris planted the thermidromes where they were supposed to be, up on the other side of the shed! In which case, I´m going to have a *lot* of garlic. I planted the tubers with handsful of comfrey- it had sprouted quite a lot and knowing how big it gets later, I simply twisted off all the top growth. Was just covering over the Charlottes when the heavens opened and I took my chance to plant the shallots, which one can do easily under a golf brolly! 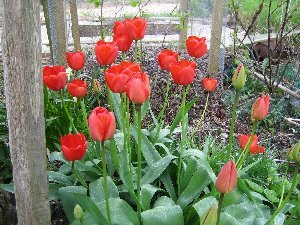 Came out again as the rain eased and planted up the Picasso maincrops, which have a generous spacing and I hope will do well. Had a look at the apparently weed-covered bed by the shed, only to recognise the plethora of seedlings there. Self-set Purple Sprouting Broccoli!!!! So I don´t have to sow any here, I´ve got a ready-made seedbed, and will only have to shift them when I need to plant onions (which I haven´t got yet... more late planting!) and they could go in the winter onion bed in the meantime (currently covered with canes). And to welcome me back, I´ve been bitten on the legs. Argh! Got back to car to find baby fast asleep and husband reading. Not a bad state! Back at the house, things are coming on nicely. I may not be able to get up much, but I certainly have to work fast when I´m there. But at the house, I can entertain MiniSir at the same time as potting etc. 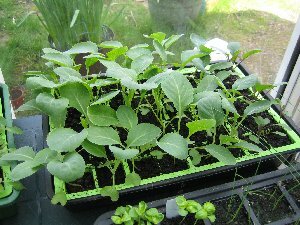 So I currently have in modules some basil, leeks, cabbages and tomatoes. I´m gradually pricking out the tomatoes into small pots, and have done just over 20 of the San Marzano so far. 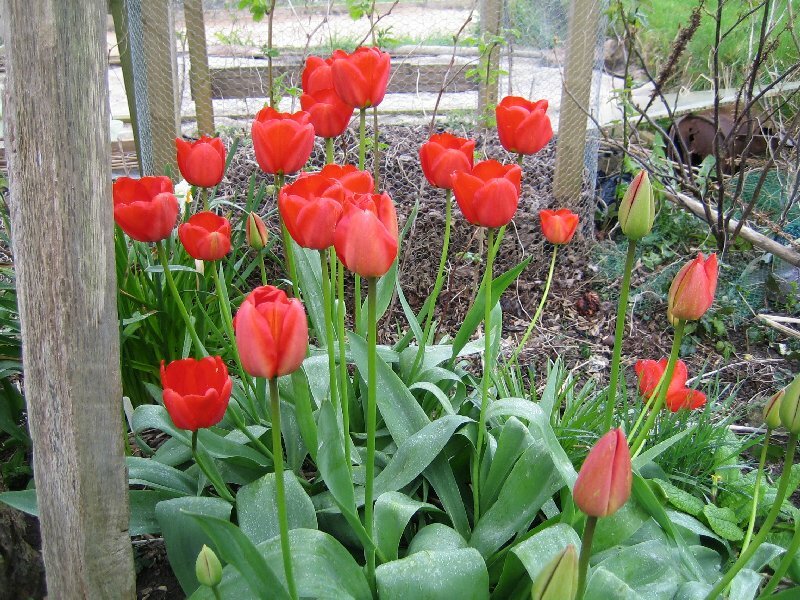 I have four Cream Sausage left, plus three Gardener´s Delight which will get kept at the house in the potting shed. They ought to love the temperatures it gets to in there! Basil and leek. 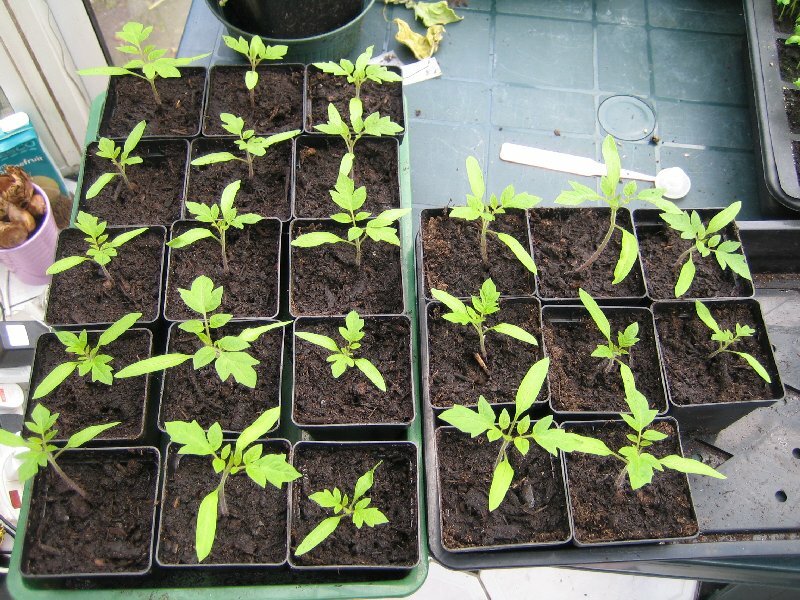 Yes, the basil is going to be potted on soon, and more sown. Despite a really horrible cold, got Sir to babysit and took the last potatoes up to the plot. Chris was already up there, and told me that she was awaiting the annual manure delivery. Lovely! I timed that right... 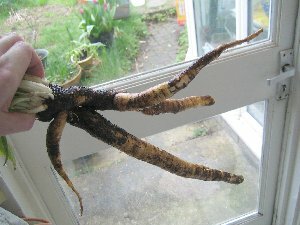 Unfortunately I didn´t bargain on feeling so awful that when it did arrive, I managed perhaps a dozen shovelfuls to get it off the path and onto the area around the redcurrants. 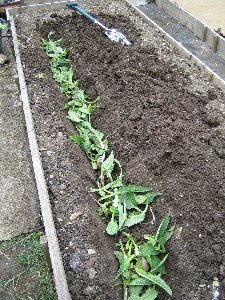 Did however manage to plant up the Ratte spuds: popped them into the gaps at the end of the existing rows, six on one row and two on the other, again with comfrey. I only really wanted eight so just as well! Gave the rest to Kate, who also has a lousy cold. Poor cherry tree not looking too happy as three main branches are dead. Cut them back and then bent a side branch upwards to take over as leader. Looks a bit better now, and hopefully there will be some regrowth. The grass is quite awful at the moment, and had a struggle to get a couple more clumps out. Little by little, I´ll win. Meanwhile... dug up nine of the tiny PSBs and potted them up into a module tray. 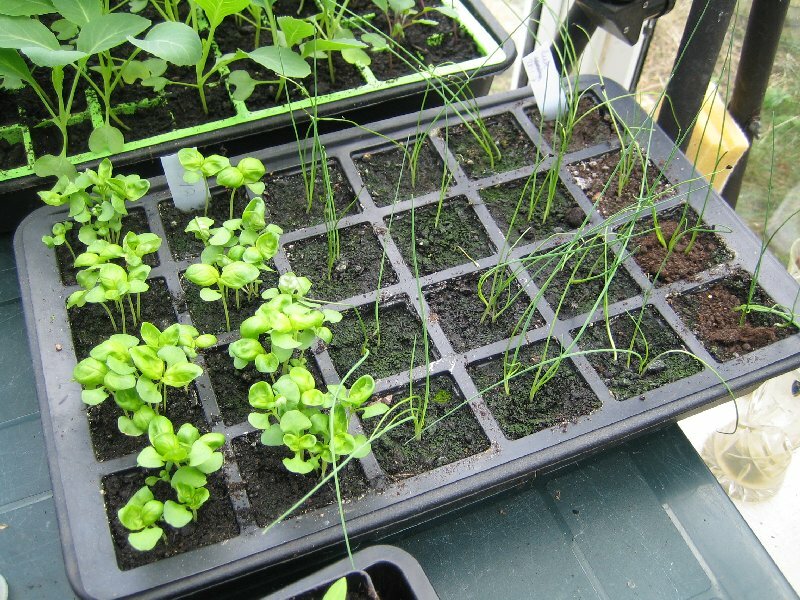 Hopefully that´ll be enough - I need the bed for the onions! Felt too ill to stay much longer and so went home with some of Chris´s PSB and kale. Yum.